One of the fastest-growing sectors in the tourism world revolves around food and beverage experiences. As more and more people consume food programming like Top Chef, MasterChef, and Chopped, these television viewers are increasingly interested in experiencing award-winning chefs and cutting-edge cuisine first-hand. 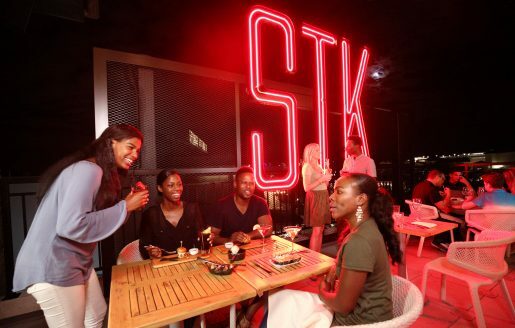 Not surprisingly, large parks and resorts are increasingly embracing this trend with one of the industry’s biggest players redesigning one of their signature destinations into a foodie’s paradise. When the Walt Disney World Resort first opened, it featured lots to do but was fairly light on shopping. That changed in 1975 when Disney opened Lake Buena Vista Village on the northside of its property. Positioned to serve both locals and guests, Disney conceived of the Village as a premier shopping destination in the Sunshine State. Within just a couple of years, the area underwent one of several re-brands and became the Walt Disney World Village. Disney eventually settled on Downtown Disney in the late 1990s and grew the area into a large mixture of food, beverage, shopping, and entertainment. 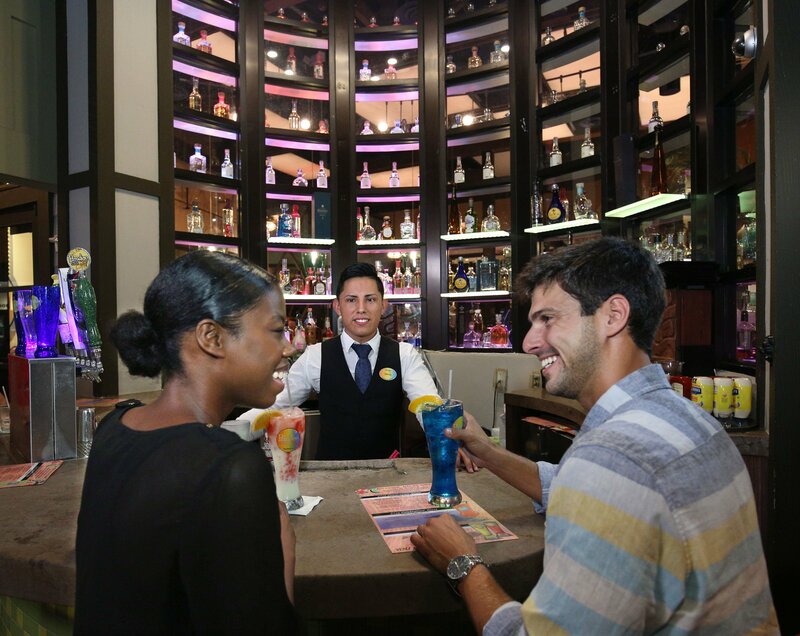 A man and a woman photographed at Disney Springs, Walt Disney World Resort, Fla., at the Paradiso 37 restaurant. Photo provided by Disney. While Disney did experiment early on with celebrity chef concepts at Downtown Disney (including multiple Wolfgang Puck venues), Downtown Disney never really was positioned as a food tourism destination. This may have been because the super popular food channels and television shows had not become commonplace on cable television yet. Or it may have simply been a deliberate choice to focus more on “eater-tainment” concepts like House of Blues, Rainforest Café, and T-Rex restaurants where the cuisine generally took a back seat to elaborate animatronics and performance venues. Whatever the reason, Disney has dramatically reversed course with its most recent re-branding of the original Lake Buena Vista Village. 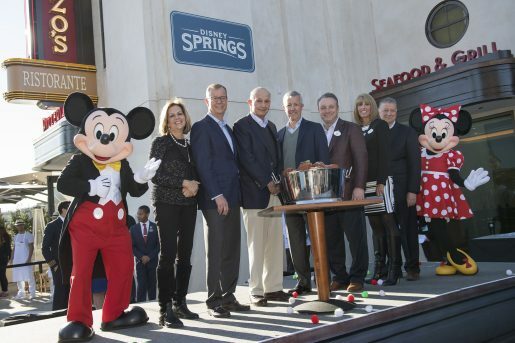 Now known as Disney Springs, this revamp has largely eschewed eater-tainment and replaced it with a heavy emphasis on name-brand and award-winning chefs. Officials at the grand opening of a Mario & Enzo restaurant in Disney Springs. The theme of this Italian trattoria is an airline terminal built in the 1930s, and it offers a full bar plus rare Italian wines. Photo provided by Disney. These days, Disney Springs offers dining options from six James Beard Foundation Award-winning chefs—one of the largest single site collections outside of Vegas. These James Beard winners include a diverse group of culinarians such as Art Smith, Masaharu Morimoto, Rick Bayless, Tony Mantuano, José Andrés, and Wolfgang Puck (still around from the Downtown Disney days). In addition to the James Beard winners (basically the Academy Award of food) Disney World has also added celebrity chefs such as Guy Fieri and James and Julie Petrakis. The food and beverage trend at Disney Springs is clear to see: partner with nationally-known chefs who have built their exceptional culinary skills before a national and international foodie audience. Even more interesting is the fact that Disney has tried to develop chef-driven concepts with an authentic connection to their Central Florida roots. For example, Celebrity Chef Art Smith’s family has farmed here in Florida for six generations, and his new restaurant is dedicated to the Florida fare he grew up with. Guests photographed at STK Orlando at Disney Springs. Photo provided by Disney. 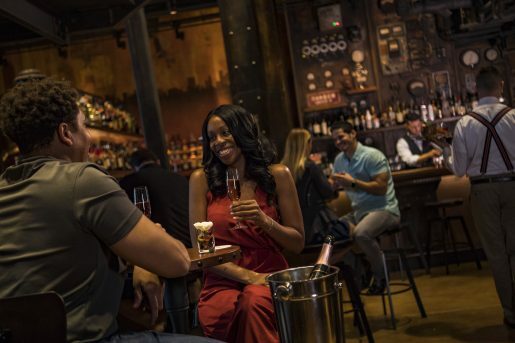 While national names play a big part in the Disney World strategy for enticing food travelers, they’ve also paid close attention to local celebrity chefs such as renowned Orlando chefs James and Julie Petrakis. After realizing big success and industry recognition for their Winter Park (just north of Orlando) concept known as The Ravenous Pig, the Petrakis’ brought their celebrated meat-forward talents to Disney Springs with the opening of The Polite Pig—a sister concept that serves up modern barbecue with Southern sides a bourbon bar offering more than 50 selections plus their own locally-brewed beer. Disney is replicating this local-centric food approach with another concept from award-winning and Orlando-based 4R Restaurant Group. The 4R Cantina Barbacoa Food Truck will serve a variety of signature dishes, including a taco cone and burrito bowl filled with choice of meats such as brisket barbacoa or pork sofrito. As you can see, Disney is leaning heavily on third-party chefs and restaurateurs to hopefully attract tourists who appreciate great food while on vacation and, potentially in some cases, choose where to travel based on the culinary offerings in addition to their favorite theme park attractions. In some ways, it would probably have been simpler to develop in-house concepts (which Disney does continue to also do) but, in many ways, the type of food is taking a back seat to the brand behind the food. A woman photographed with a drink at The Edison at Disney Springs. Photo provided by Disney. This trend certainly isn’t unique to Disney among the industry’s large parks and resorts with Universal, Dollywood and others entering into partnerships with nationally and locally-awarded chefs. Even though it may be more challenging (in large part because of costs) for smaller amusement facilities to partner with the Art Smith’s and Rick Bayless’ of the food world, you can take a chapter out of Disney’s foodie playbook by embracing local chefs and restaurateurs. For instance, rather than just serve your own in-house pastries, doughnuts or coffee, identify regional artisans who are generating headlines and big crowds with these offerings. The same holds true for concepts like BBQ, burgers, and even something slightly more exotic like sushi. Identify who is doing it best in your regional market and reach out to determine if they are open to opening even something as small as a kiosk at your facility. After all, today’s out of home entertainment guest isn’t just looking for the cheapest, fastest and most non-descript meal they can find. 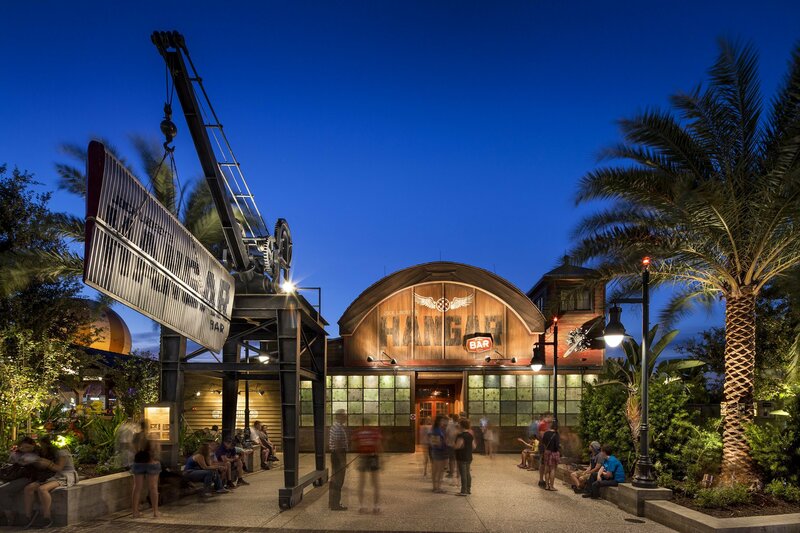 A view of Disney Springs’ Jock Lindsey’s Hangar Bar.